We’re hosting a Community Apple Pressing this Saturday afternoon, Oct. 10, on the south side of Pineview Park (just west of Rattlesnake School) in the middle Rattlesnake. We’ll be there from 1-5 pm with a cider press from MUD (Missoula Urban Demonstration Project). We have quite a few apples (and some pears) to press because we’ve been volunteering with the Great Bear Foundation to harvest surplus fruit around the valley. 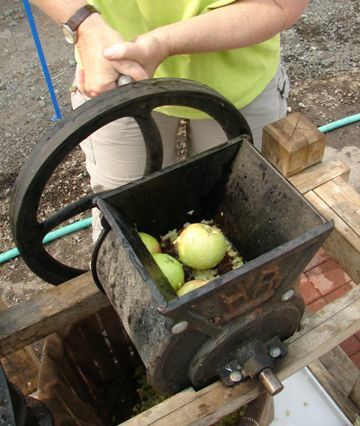 You can bring your own apples and/or pears, along with containers to take home any cider you press (figure about 1 gallon of cider per 18-30 lbs. of apples, depending on how juicy they are). For more information, email us or phone: 240-1986 or 728-4711. Hope to see you there! Posted on October 9, 2015, in Uncategorized. Bookmark the permalink. Leave a comment.